Now is the perfect time of year for area employers to take advantage of the federal and state tax incentives for hiring people with disabilities, especially during October, National Disability Employment Awareness Month. “Workers with disabilities represent all skills sets and are ready to get the job done,” said Kathleen Martinez, Assistant Secretary of Labor for Disability Employment Policy. This year’s theme, Profit by Investing in Workers with Disabilities, promotes the valuable contributions people with disabilities make to America’s workplaces and the economy. For years, Kennedy Center Employment Services, headquartered in Trumbull, has been placing clients with area businesses in Fairfield and New Haven Counties. One business clearly stands out: Automated Services in Milford founded by its President Mike Daddona of Orange. Automated Services currently employs four clients from The Kennedy Center. In fact, over the past seven years, over 20 Kennedy Center clients have passed through his company’s doors. This food service vending machine and amusement games company is a big advocate of hiring people with disabilities. 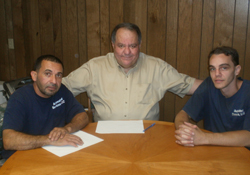 At age 17, Daddona started his business nearly 40 years ago. He has expanded numerous times and currently employs a staff of 36. He particularly enjoys educating students from the Kennedy Center’s Partner’s School Transition Program, who are exploring vocational opportunities in warehouse work and food preparation. “I grew up in a lower middle class family and had the ambition and drive to succeed,” said Daddona. A graduate of Amity High School, he believes in mentoring new employees. In 2008, The Kennedy Center recognized Automated Services as Competitive Employer of the Year at its Annual Awards Dinner. That same year, Daddona generously sponsored a business after hours event for The Kennedy Center at Harboryard in Bridgeport and donated a home slot game as a raffle item. Daddona personally coaches each new Kennedy Center hire and gives them one-on-one pep talks about the importance of hard work. Using his personal life story as an example, he illustrates that it is possible to succeed against all odds. Although he receives tax incentives for hiring people with disabilities that was not the motivation in Daddona partnering with The Kennedy Center. However, he does receive both the Work Opportunity Tax Credit (a Federal Tax Credit of up to $2,400) and the more recent State of CT Job Creation and Vocational Rehabilitation Tax Credits. This state tax credit provides incentives for hiring individuals in new positions who are referred from a Vocational Rehabilitation provider to create jobs. These incentives allow employers who meet the criteria to receive a CT State tax credit of $200 per month per person for 2010, 2011 and 2012. Marketing and Employment Relations Manager for Kennedy Center Employment Services, at 203-365-8522, ext.240.